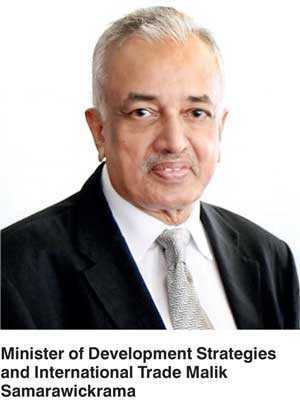 The Minister of Development Strategies and International Trade Malik Samarawickrama has issued the following statement on the Sri Lanka-Singapore Free Trade Agreement signed in January 2018 but has drawn renewed comment in recent weeks. This Ministry wishes to refer to the recent news items where it has been stated that recently signed Free Trade Agreement (FTA) with Singapore was entered into without proper consultation process, and will have adverse impact on Government revenue, and would result in influx of professional and workers entering the country. This Ministry wishes to state that it is the policy of the Government of Sri Lanka to negotiate FTAs with selected countries, as part of its new Trade Policy. The aim of this policy is to achieve a diversification of exports and export markets; to create linkages to global production and value chains; integrate Sri Lanka to the global economy; and thereby by virtue of the nexus between trade and investment, attract Foreign Direct Investment (FDI) into the country. The Government has adopted a policy of engaging in a dialogue and consultation with all stakeholders in pursuing this goal. My Ministry has been holding regular consultations with Trade Chambers, Trade Associations and Professional bodies. Stakeholders have also been kept informed of the status of the negotiations and possible commitments that were to be undertaken on regular basis. This Ministry has also had specific consultations with stakeholders in Construction Related Services, Computer Related Services, Tourism sector, Maritime sector and the other this engagement will continue. Certain Professional Association have expressed their concerns about the influx of professionals and other workers into the country. The Movement of Natural Persons from Singapore has not been opened except for intra-corporate transferees in senior management and business visitors linked to investments. There is no liberalisation whatsoever of independent movement of natural persons (not linked to investment).Business visitors will be permitted for a period of not more than 30 days for purposes such as market scoping, business agreements and so on. Cooperate transferees (transferees from a branch of a company with an investment in Sri Lanka) are also limited to managers, executives and specialists who are clearly defined in the relevant schedules of the Agreement. Their period of entry is also limited initially up to two years or over the period of contract, whichever is the less with an extension not exceeding a total of five years. No Movement of Persons either Singapore citizens or permanent residence have been opened in professional services. The concern that engineering and architectural services have been opened is also incorrect. This Ministry wishes to state that the only commitment is for cross border services (via the internet – and not relating to movement of people) and that too limited only to predesign advisory and consultative services and does not include the practice of architectural or engineering profession. This is only through use of internet and other means and not through investment, commercial presence, of movement of professionals to the country. Providing this type of services is already possible through the existing regulation and legislative framework. Thus, establishing a company for providing these advisory services in the country or Movement of Natural Person to provide such services have not permitted under this agreement. It should be emphasised that Sri Lanka has not undertaken any liberalisation exceeding the prevailing investment regime. The new regulations under the Immigration Act in order to strengthen the regulatory framework have almost been finalised and will be submitted to the Cabinet shortly. When they come into force, they will address the concerns raised by the Professional Associations as well as other stakeholders. The regulations will stipulate procedures to be followed when employing foreign nationals, categories of employment, employer and employee obligations, and the roles to be played by the professional bodies on recognition of qualifications etc. It has also been stated that this Agreement would lead to “millions” of non-citizens of Singapore arriving into Sri Lanka including PR holders and citizens of India, Bangladesh and other countries. It should be mentioned that the entire permanent resident population of Singapore is only 527,000 in 2017. Second, the SLSFTA does not permit any permanent resident to work in Sri Lanka. The only permitted entrants are those who qualify as corporate transferees: i.e., persons employed by a Singaporean company with investments in Sri Lanka. Third, such persons would have to be employed in that company for at least 12 months. Furthermore, only the most skilled and highest tiered personnel are eligible – this is clearly defined in the schedules. Fifth, if a person has a “dominant and effective nationality” in a third country, such persons would be excluded. Therefore, a Singapore company cannot higher and send a citizen of another country to work in Sri Lanka. To say so is inaccurate and misleading. Given the above facts, the permanent residence holders arriving in Sri Lanka is extremely limited and entry will be tied to a corresponding investment in Sri Lanka, thereby benefitting the country as a whole. There has also been reference to the Tariff Liberalization programme (TLP) of the Agreement. Whilst it is true that Sri Lanka undertook to liberalise 80% of its tariff lines when Singapore has already liberalised 99% of its tariff lines, it is misleading to even claim that it amounts to a unilateral concession. The SLSFTA, like most other present-day FTA’s incorporates several sectoral chapters that include trade, services, investment, economic cooperation and others. Hence, the benefits cannot be weighed in compartments. Concessions granted under one chapter result in a ‘quid pro quo’ in others. The prime objective of the SLSFTA is to attract FDI from Singapore into Sri Lanka in the manufacturing and services sectors and to link to global production and value chains. In this regard a high-powered Singaporean business delegation visited Sri Lanka in this week to explore investment possibilities and establish business contact with the business community. In any event, it should also be noted that in FTA’s signed by Singapore with its other trading partners, the level of liberalisation invariably exceeds 90% of the tariff lines. Sri Lanka, in comparison, has been able to limit it to 80%, thereby keeping 20% of tariff lines in the Negative List to accommodate domestic sensitivities and revenue concerns. -.7% will be eliminated from the eleventh to the 15 years. Accordingly, (a) tariff reduction and elimination will be a gradual process, and (b) most of the “semi sensitive tariff lines” are included in either the seventh to the 12th-year period or the eleventh to the fifteen-year period. It has been also mentioned that tariff liberalisation will result in a substantial loss of revenue to the Government. Obviously, this has been factored into our negotiation. There will be little or no impact from the immediate list since those lines are already duty free and CESS free on a MFN basis. Moreover, import data on products imported from Singapore will show that out of total imports of $ 1293 million in 2017, $ 750 million were petroleum and related products (in fact amounting to 60% of imports from Singapore) and $ 228 million were gold. Since tariffs on petroleum products, tobacco, spirits and alcohol are an important revenue source to the Government these items have been retained in the List of products that will not be subject to liberalisation, thereby protecting revenue. The bulk of the remaining imports in the TLP are mostly inputs or intermediate goods needed for local industry and which will increase their competitiveness and benefit consumers in Sri Lanka. This Ministry would like to add that the TLP was finalised in consultation and with the agreement of Ministry of Finance. Furthermore, the Rules of Origin criteria in the Agreement stipulate that product imported from Singapore will not qualify for tariff concessions unless 35% Value addition over change of Tariff Heading take place in Singapore. The Rules of Origin in the Agreement will therefore not allow goods simply be exported through Singapore, since minimum value addition or processing has to necessarily take place in Singapore. This ministry will continue to engage in constructive dialogue with the trade chambers and professional bodies, even in the future, as we negotiate in the other Agreement.